It seems that Thames Water are causing quite a storm of their own with their high handed approach to selecting sites for these works. No-one denies the need for this project designed to reduce the risk of properties being flooded by sewage. My office has been flooded twice and I know from personal experience how awful it is. It must be much worse if it is your home. See what Andy Slaughter has been saying on the subject in his current blog. Please tell us how you think the Hammersmith Society can assist with this problem. As most of you know, the Mayor of London successfully persuaded the Government that he should manage the development and planning controls around Old Oak Common and Park Royal (also includes Wormwood Scrubs) in the same manner as the Mayor was responsible for the Olympics site. The Old Oak and Park Royal Development Corporation (OPDC) became official from 1 April 2015. The Acting Chief Executive is Victoria Hills and the Chief Planning Officer is William McKee (formerly of this parish – Remember him?). Things are due to move fairly quickly and are all linked in with Crossrail and HS2 which will meet if all goes well to provide a station as large as Waterloo on the site. The Hammersmith Society have asked to be a major consultee and we are due to have a meeting with OPDC in the next two weeks. Council Consultation : 20mph Speed Limit? Closing date for comments 31 July 2015. The exhibition is due to move to a venue near the Town Hall in the coming weeks. Closing date 5pm Friday 3rd July. This a news update which has recently been sent to our members : If you are not receiving these regular bulletins, but would like to, please contact the Chairman, Tom Ryland – See contact details. 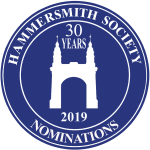 If you are not a member of the Hammersmith Society but would like to join, please contact Rosemary Pettit, Membership Secretary. The Hammersmith Society tries to fulfil its roles as a linking organisation for the many and diverse local groups within the Hammersmith area and disseminating information on local projects and initiatives. Do please keep us informed of any issues where our support would be helpful. This is my first ‘electronic’ newsletter since taking over as Chairman from Rosemary Pettit. My first task is therefore to thank Rosemary for her excellent and unstinting stewardship of the Society over the last three years. She will be a hard act to follow – so you may be getting fewer of these for a start! Needless to say Rosemary is far from retiring and has taken on the task of Membership Secretary and will hopefully boosting our numbers. Please encourage your individual members to join the Hammersmith Society : I attach a Membership Form but this can also be found on our website – See below.